This page contains archived content and is no longer being updated. At the time of publication, it represented the best available science. By early August 2010, two weeks of devastating monsoon rains had transformed the landscape of Pakistan, pushing rivers over their banks, inundating villages, washing away bridges and roads, destroying crops, and killing livestock. By August 12, 2010, more than 1,600 people had perished, according to news reports, and the United Nations Office for the Coordination of Humanitarian Affairs (OCHA) estimated that more than 14 million people had been affected in some way. 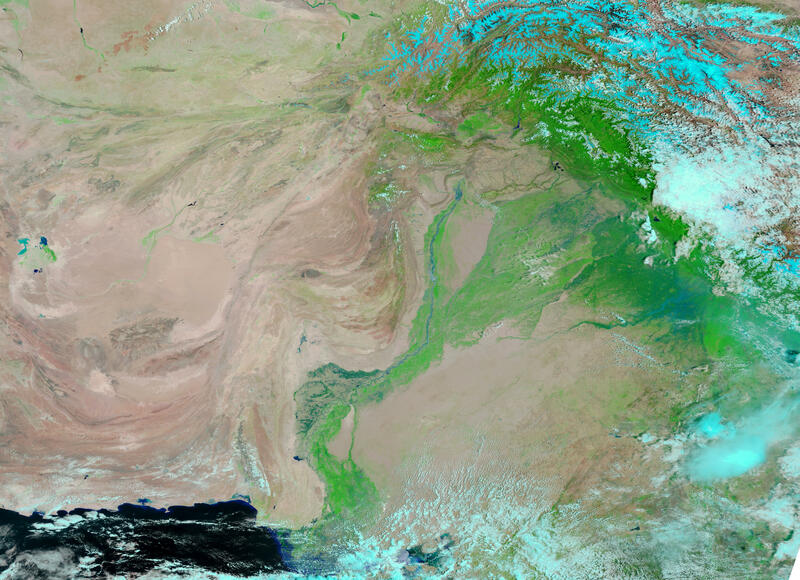 To the Moderate Resolution Imaging Spectroradiometer (MODIS) on NASA’s Terra satellite, the impact of Pakistan’s floods was most obvious along the major rivers. These images use a combination of infrared and visible light to increase the contrast between water and land. Water appears in varying shades of blue, and clouds appear in varying shades of blue-green. Vegetation is green, and bare ground is pinkish brown. The top image is from August 11, 2010, after two weeks of flooding had devastated the country. For comparison, the bottom image shows the same region one month before, on July 10, 2010. In the image from July 10, the relatively narrow Indus River remains confined to its banks, and the Jhelum and Chenab Rivers, which flow into the Indus, are barely discernible. 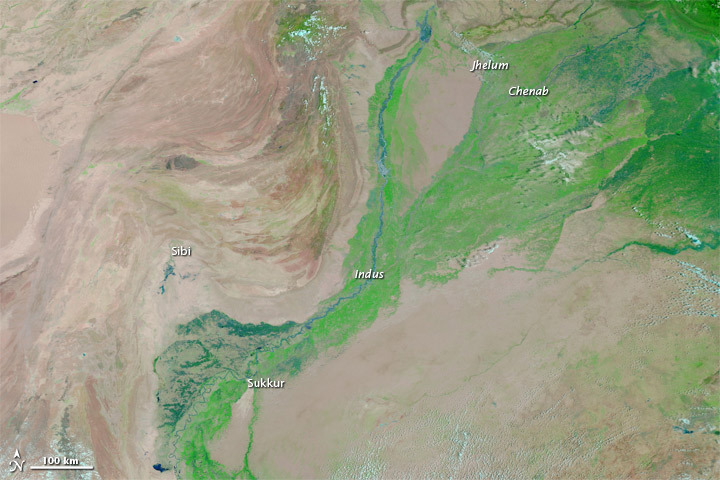 In the image from August 11, all three rivers are swollen, and the Indus River has pushed over its banks even before it meets the tributaries flowing from the east. By August 11, floodwaters, which initially hit northern Pakistan the hardest, had spread southward along the Indus. Northwest of the bend in that river, standing water is apparent around the city of Sibi. South of Sukkur, where a barrage modifies river flow, the Indus narrows somewhat, but flooding is apparent there as well. 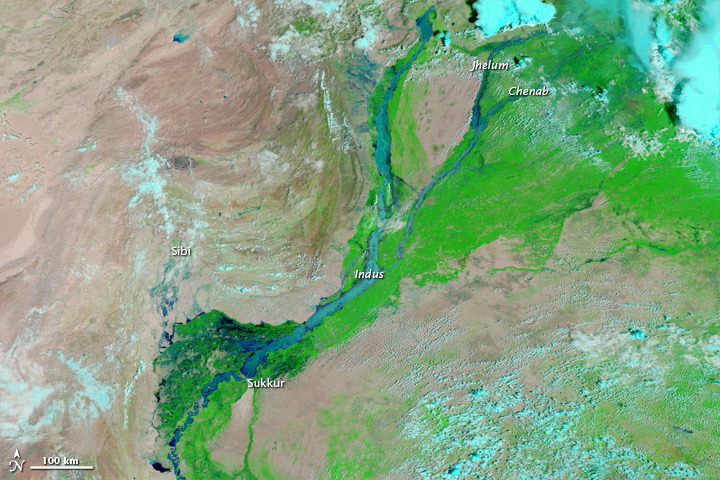 In fact, MODIS acquired this image as the Indus was rapidly rising south of Sukkur. The torrential monsoon rains that devastated Pakistan in late July and early August 2010 were part of a larger pattern of unusually heavy monsoon rains across Asia, perhaps driven at least partly by La Niña. OCHA stated that the scale of destruction from Pakistan’s monsoon flooding surpassed the devastation from the 2004 Indian Ocean tsunami, the 2005 northern Pakistan earthquake, and the 2010 Haiti earthquake combined. As monsoon season was not over, OCHA described the situation as an “evolving emergency.” Multiple relief efforts, however, were already underway. U.S. troops worked with Pakistan’s military to deliver aid. The World Food Programme and partner agencies had delivered more than 4,350 metric tons of food to at least 370,000 people, and the United Nations Children’s Fund (UNICEF) had delivered clean drinking water to more than a million residents. NASA images courtesy the MODIS Rapid Response Team at NASA GSFC. Caption by Michon Scott. 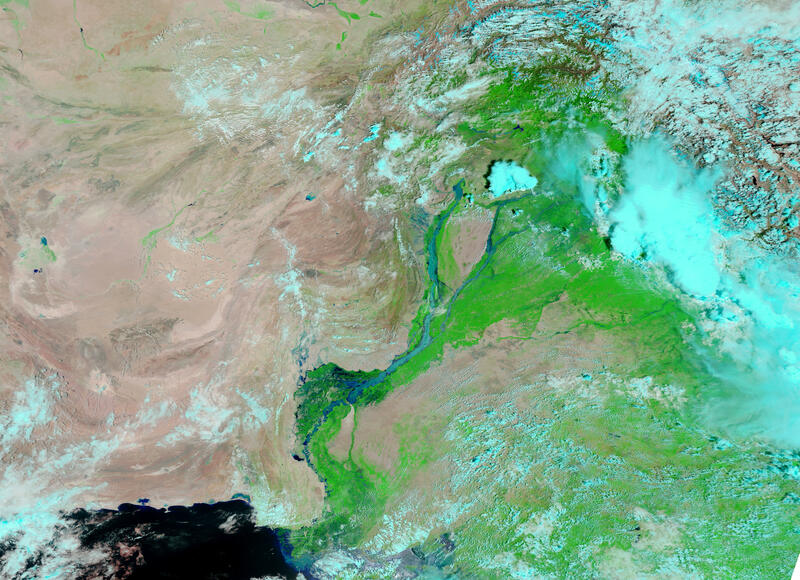 Acquired August 11, 2010, and July 10, 2010, these false-color images show a substantial rise in water levels along Pakistan’s rivers caused by monsoon flooding. Widespread and heavy monsoon rains in July and August 2010 led to deadly flooding in Pakistan. Months later, large parts of the country remained underwater. Agence France-Presse. (2010, August 8). U.N. to launch appeal for Pakistan flood disaster. Accessed August 12, 2010. Aziz, F. (2010, August 12). Pakistani president tries to comfort flood victims. Reuters. Accessed August 12, 2010. Brummitt, C. (2010, August 11). U.S. aid winning friends in flood-ravaged Pakistan. Associated Press. Accessed August 12, 2010. United Nations Office for the Coordination of Humanitarian Affairs. (2010, August 12). Pakistan: Initial floods emergency response plan requires $459.7 million. ReliefWeb. Accessed August 12, 2010.